Tomato and Garden Vegetable Sauce 200g 12 pcs. If you like to serve pasta with a tasty but light sauce, Eataly has just the thing for you: the handy value pack of 12 jars of Tomato and Garden Vegetable Sauce from the Dispensa di Amerigo. 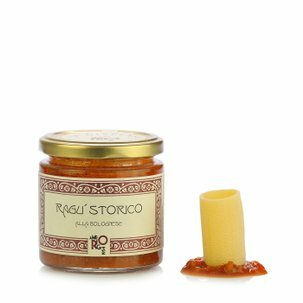 Made using fresh tomatoes and freshly harvested vegetables, this is a simple but delicious condiment, ideal for adding a touch of originality to traditional pasta dishes. Ingredients Tomato and Garden Vegetable Sauce 200g:tomato passata 77.9 g, peas 6.3 g, extra virgin olive oil, green courgettes 4.5 g, carrot 4.5 g, red and yellow peppers 4 g, Medicina golden onion 3 g, Cervia sea salt. The Dispensa di Amerigo was created out of the determination of Alberto Bettini, third generation patron of the very famous trattoria Amerigo di Savigno (the only one in Italy honoured both with a Michelin Star as well as a Slow Food snail of approval). Together with his friend Roberto Zivieri, Alberto decided to transfer more than 70 years of experience working in the trattoria's kitchens to a new laboratory where excellent jarred products could be produced. 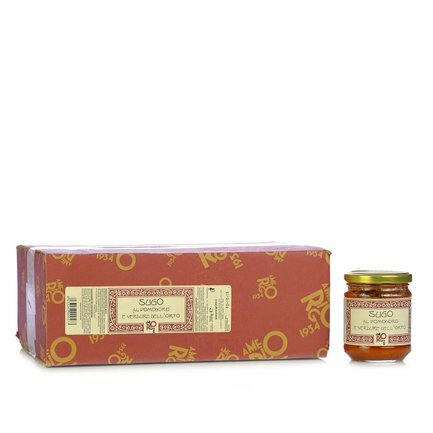 Every recipe produced by Dispensa di Amerigo is exquisite, of course: the red onion jelly is the result of a traditional recipe, the products conserved in oil and in vinegar are produced starting with the freshest products harvested in season, the ragùs and creams are directly taken from the specialities of the trattoria. The entire line from Dispensa di Amerigo, in addition to being excellent and of very high quality, is also free from preservatives, colourants and artificial flavours.